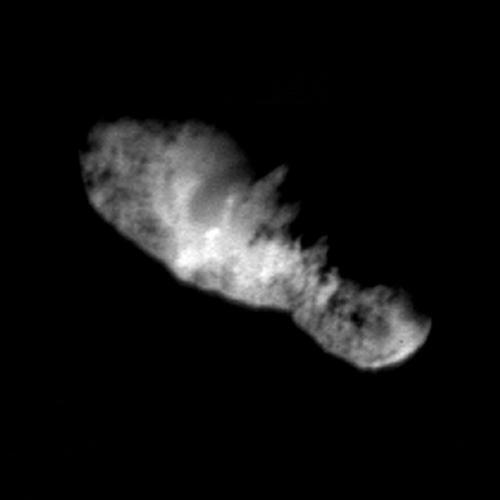 In this highest resolution view of the icy, rocky nucleus of comet Borrelly, (about 45 meters or 150 feet per pixel) a variety of terrains and surface textures, mountains and fault structures, and darkened material are visible over the nucleus's surface. This was the final image of the nucleus of comet Borrelly, taken just 160 seconds before Deep Space1's closest approach to it. 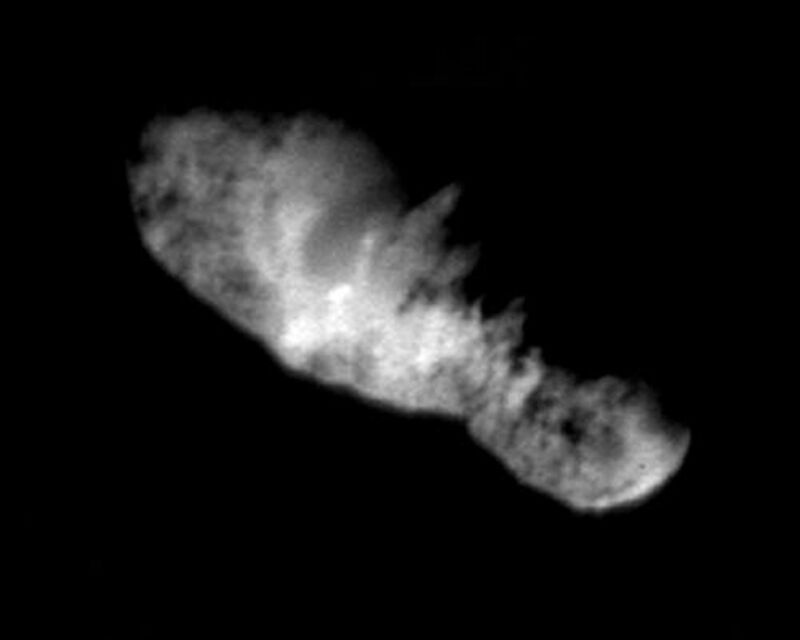 This image shows the 8-km (5-mile) long nucleus about 3417 kilometers (over 2,000 miles) away. Smooth, rolling plains containing brighter regions are present in the middle of the nucleus and seem to be the source of dust jets seen in the coma. 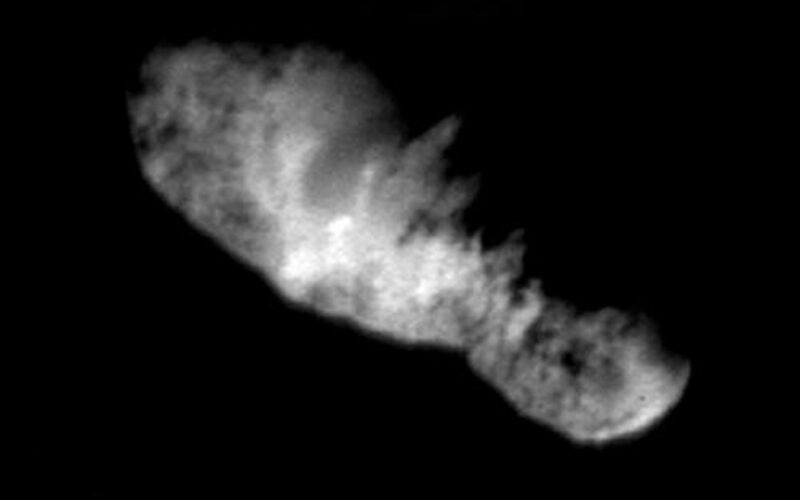 The rugged land found at both ends of the nucleus has many high ridges along the jagged line between day and night on the comet. This rough terrain contains very dark patches that appear to be elevated compared to surrounding areas. In some places the dark material accentuates grooves and apparent faults. Stereo analysis shows the smaller end of the nucleus (lower right) is tipped toward the viewer (out of frame). Sunlight is coming from the bottom of the frame. Deep Space 1 completed its primary mission testing ion propulsion and 11 other advanced, high-risk technologies in September 1999. NASA extended the mission, taking advantage of the ion propulsion and other systems to undertake this chancy but exciting, and ultimately successful, encounter with the comet. More information can be found on the Deep Space 1 home page at http://nmp.jpl.nasa.gov/ds1/. Deep Space 1 was launched in October 1998 as part of NASA's New Millennium Program, which is managed by JPL for NASA's Office of Space Science, Washington, D.C. The California Institute of Technology manages JPL for NASA.